We’re fairly used to seeing large-scale collaborations between builders in the post-apocalyptic theme, as well as at events like BrickCon, but it’s fairly unusual to see a collaborative LEGO castle. This diorama by Finnish builders Panzy-boe and Finland Brick hits a lot of high points for me, including off-the-grid construction, water feature with landscaping, dynamic minifig action, and more. One of the things I like most about the main castle structure is that the top of the wall isn’t straight — it incorporates a rock outcrop in the upper-left corner that forces the castle wall to follow the terrain. My only complaint is that there aren’t more pictures. 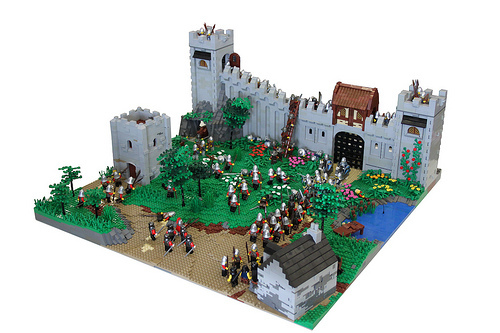 A large LEGO build like this is an opportunity to create little scenes throughout the diorama. From the overview picture, it’s clear that the builders did so (I’m especially curious what’s going on in what appears to be a little cave in that rock), but without close-up photos, we can only admire this excellent scene from a distance. This diorama was unveiled this past weekend at Model Expo 2013 in Helsinki. More pictures are avaible now in my blog!